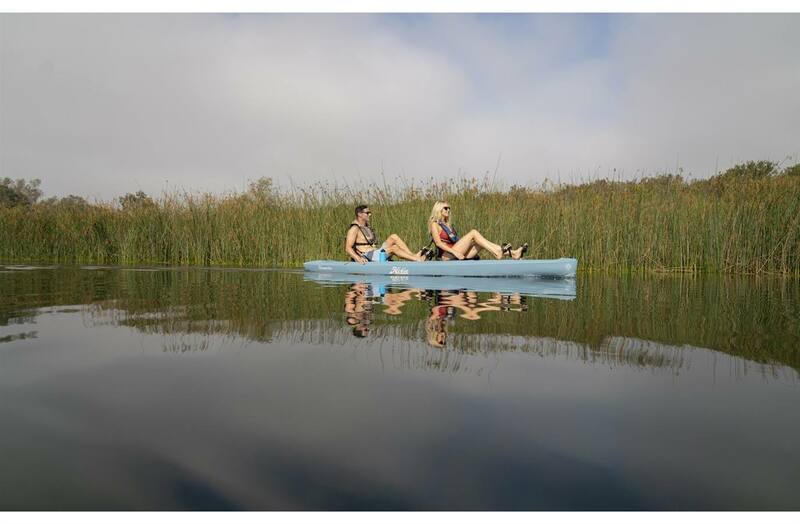 Searching for an elegantly simple yet highly customizable tandem kayak for on-water adventures with family, friends, and pets? 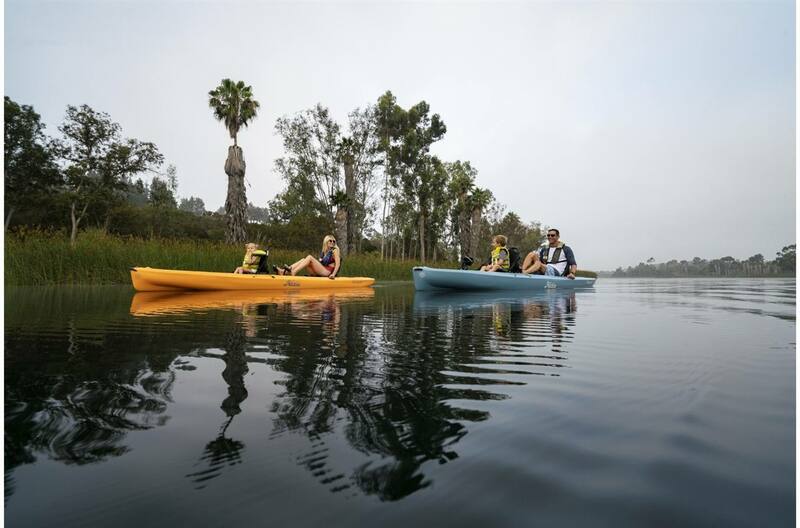 Look no further than the brand new Mirage Compass Duo, the latest addition to Hobie's lineup of award-winning pedal kayaks. Powered by dual MirageDrives with Glide Technology, the Duo's sleek hull design maximizes speed and stability, while greatly reducing drag. The cockpit features comfortable, ergonomic seating, 4 Integrated H-Tracks for accessory mounting, and abundant above and below deck storage compartments to house gear for two. 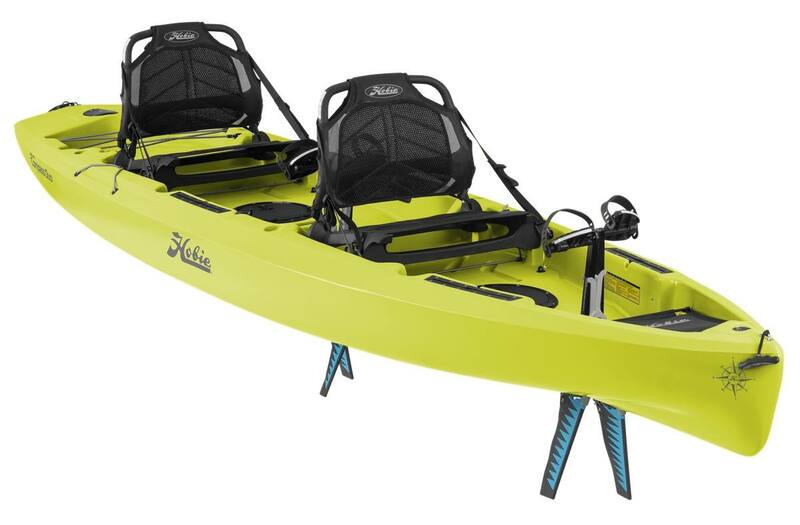 The sleek waterline and Kick-Up Rudder system make for an impressively nimble tandem kayak that's highly responsive, easy to steer and extremely durable. 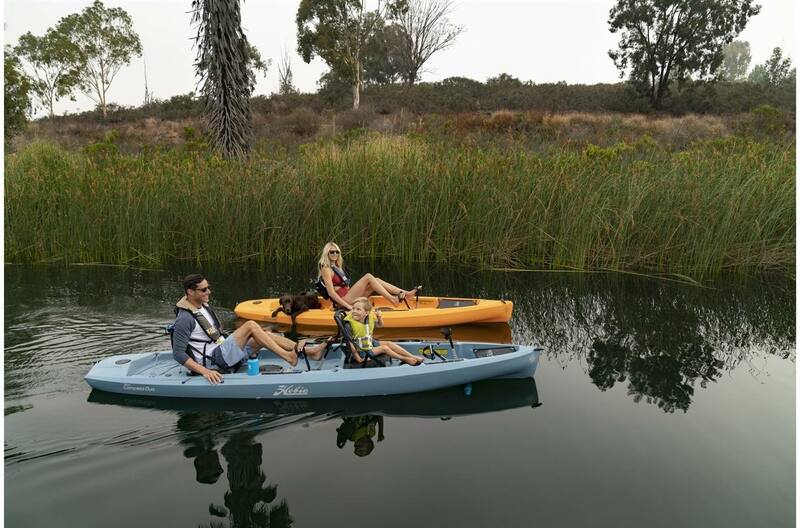 The roomy Compass Duo is simple to use and adventure-ready, making it the ideal choice for water outings with adults, tikes, and furry companions. Dual MirageDrive Powered: The Glide Technology Drive features legendary bioengineered performance. 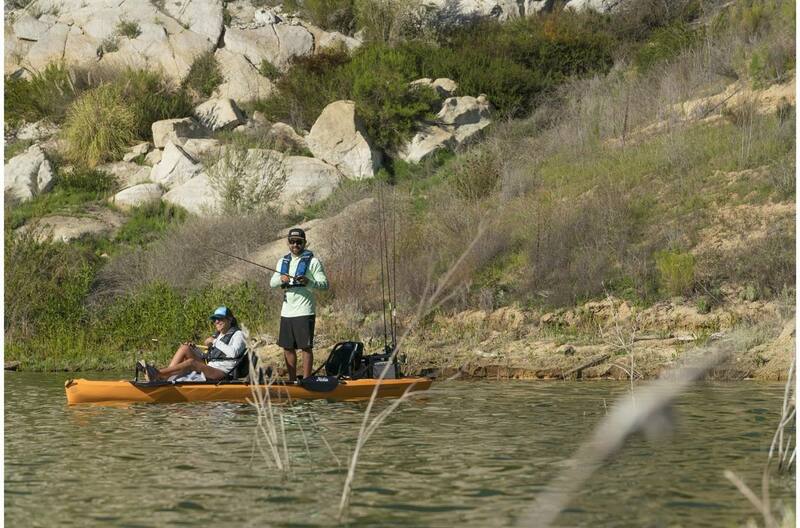 For reverse gear, see our other kayak lines with the MirageDrive 180. Excellent Hull Performance: The durable polyethylene hull hits the sweet spot between tracking and maneuverability. The oversize cockpit includes plenty of flat deck area for standing. Optimal Seating Design: The breathable mesh fabric is adjustable for comfort. Mounted at an ideal height for fishing, there's room for tackle storage underneath. Easily removable for use on shore. Easy Steering System: When you want to paddle or need to transport your Compass on shore, the spring-loaded rudder folds flush. Automatically kicks up if you hit something. Easy grip rudder handle provides fingertip steering. Storage Abounds: Bring your favorite gear along, including an H-Crate or Livewell. There's plenty of room in the mesh-covered bow storage area, stern storage area with Bungee tie-downs, and the 8-inch round Twist and Seal cockpit hatch. Accessory Ready: H-Track accessory mounts provide no-drill customization for the utmost in rigging flexibility. Four Rod Holders: The Compass comes ready to fish from the factory. 4 molded-in holsters securely tote your rods, are perfectly angled for trolling and can accommodate a gaff, nets and other gear. Carrying Handles: Conveniently located midship, bow and stern. Two-Piece Paddle: Negotiate surf-strewn beaches and rocky inlets with the included Two-Piece Paddle with Fiberglass Shaft. Drink Holder: Keep your drink close at hand. Comes standard with two, one for each user. Sail Mount: The optional Mirage Sail Kit's mast securely steps onto a deck-mounted fitting. 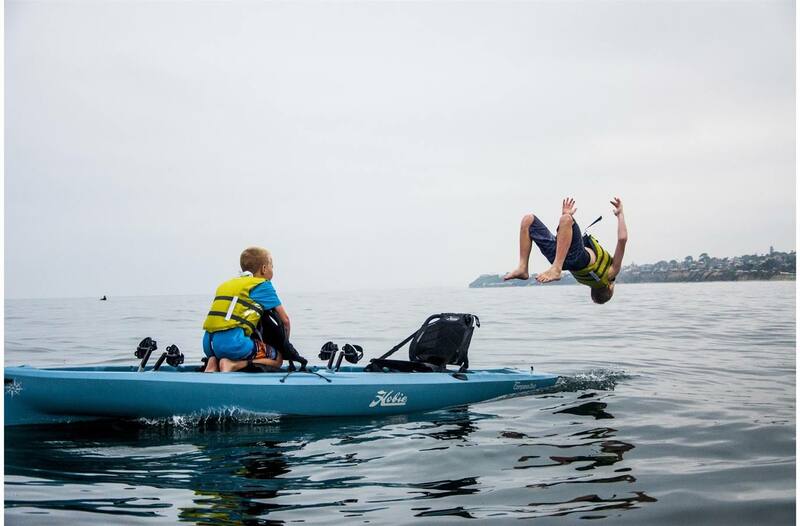 Enjoy added power without complication; Mirage Sail Kits make sailing fun and easy. 8" Twist and Seal Hatch: An efficient corkscrew mechanism ratchets down this hatch, keeping stowed items secure irrespective of the sea state. The lid is permanently attached to its base via a hinge, so you don't have to worry about leaving it at last night's campground. The Duo comes equipped with two of them. Lowrance Ready: Includes a transducer cavity for you to install a Lowrance fishfinder. Powered by MirageDrive: The MirageDrive pedal system with Glide Technology features legendary bioengineered performance. Power forward virtually hands-free. Introducing the ALL NEW Mirage Compass Duo: A perfectly minimalistic platform, designed for ultimate fun. Spend the day fishing or grab the family for a joy ride, the Mirage Compass Duo will create endless on the water memories for years to come. All new for 2019. Sleek yet Stable Hull Shape: A freshly designed bow cuts through wind, wake and chop with ease. 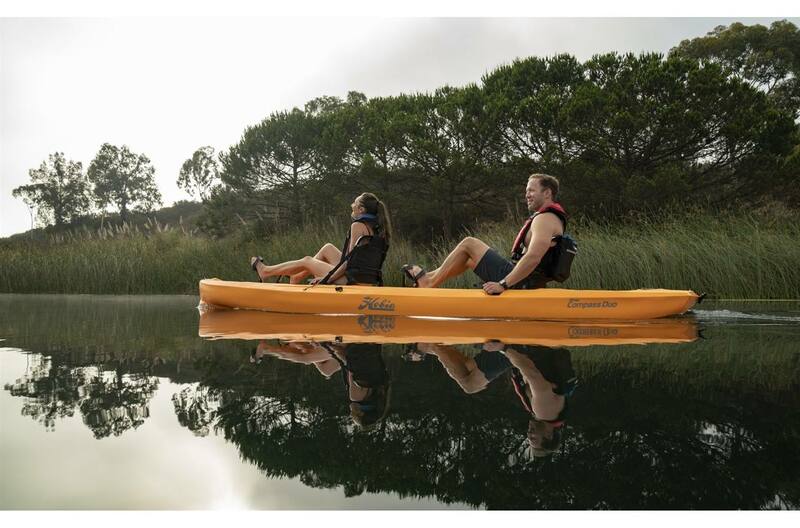 The spacious and extra wide deck provides comfort and security for even the most novice of kayakers. Kick-Up Rudder and Molded-in Tracking Keel: The Kick-Up Rudder locks in to place when you need it and retracts on impact. 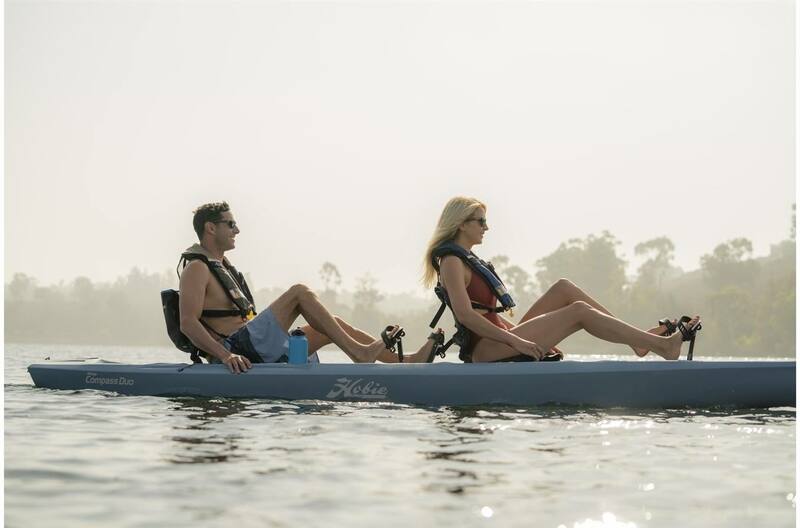 A molded-in tracking keel keeps you on course, whether pedaling or paddling. Spacious Deck Layout: Room for all the activities. Four H-Track mounts allow complete accessory customization whether fishing or looking for the perfect place to mount your GoPro. Two 8" Twist and Stow hatches provide in-hull storage and four molded-in rod holders turn this kayak into a veritable fishing machine. Install an optional Sail Kit in the new Sail mount for an added power boost. Molded-in Carrying Handles: Located midship, these handles are ergonomic and conveniently placed to make car topping a breeze. Bow and Stern handles help with transport to and from the water.